Apple has slowly begun enabling indoor maps for select airports and shopping malls, providing an early look at the new Apple Maps feature coming in iOS 11. On devices running iOS 11 beta, indoor maps are available now in Apple Maps for Philadelphia International Airport and Mineta San Jose International Airport, and for shopping malls Westfield Valley Fair in San Jose, California and Westfield San Francisco Centre in San Francisco, California. Indoor maps will provide detailed floor plans of major airports and shopping malls around the world, allowing iOS 11 users to plan ahead. 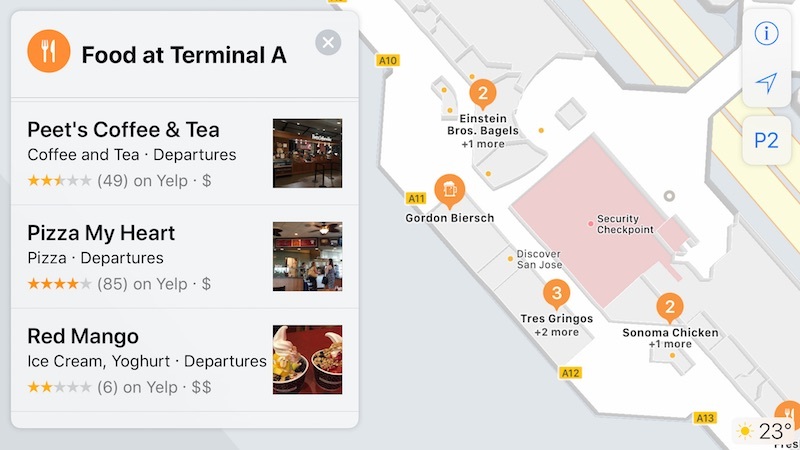 At airports, for example, Apple Maps users can tap "look inside" or simply zoom in to view terminals, boarding gates, security checkpoints, airline check-in desks, baggage claim carousels, information kiosks, restrooms, stores, restaurants, parking garages, and even escalators, elevators, and stairs. Apple Maps users can browse by floor, or search for shops, food, drinks, or restrooms in a specific terminal. Tapping on a restaurant, for example, brings up a detailed place card with photos, hours, and additional information. 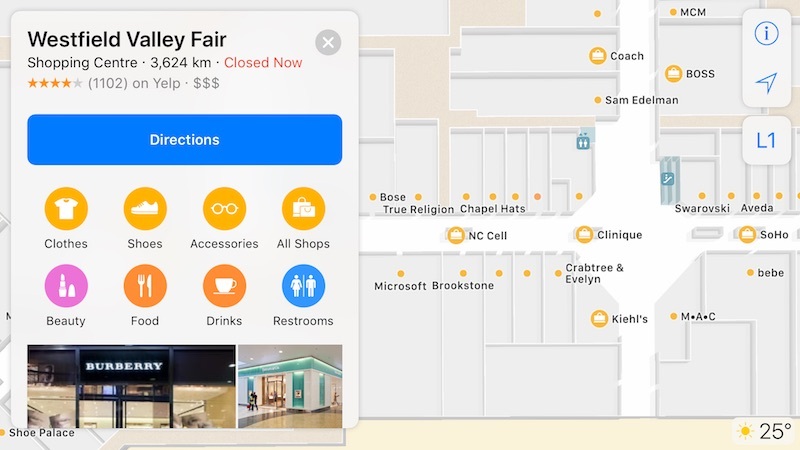 Likewise, at shopping malls, Apple Maps users can zoom in to view the exact location of stores, restaurants, restrooms, escalators, elevators, and stairs on each floor. Users can also filter stores by categories such as clothes, shoes, accessories, beauty, food, and drinks, with detailed place cards for each. Apple senior executive Craig Federighi previewed Apple Maps indoor maps at its Worldwide Developers Conference earlier this month. Skip to around the 1:07:50 mark of Apple's WWDC 2017 keynote video. At launch, indoor maps will be limited to select airports and shopping malls, in cities such as Amsterdam, Berlin, Boston, Chicago, London, Los Angeles, Miami, New York, Philadelphia, San Francisco, Tokyo, Toronto, and the Washington D.C. area. Apple said more locations will be added over time. The feature is only available in iOS 11, which is currently in beta testing. The second developer beta was released on Wednesday, and a public beta will be released later this month. The software update officially launches in the fall. Maps can't show me how to get to the end of my street half the time so good luck with this waste of time. Apple truly are the Bing of mapping services. Good feature but Apple is always a few years behind Google with stuff like this. All this is merely to mask the fact that Apple is at the end of the line of innovation in main-stream computers. They have only the froth to work with now having deserted the pro and prosumer clientele. When millennials consider smart phones uncool it will all go down the pooper. And that can happen any day now probably when someone pays Beyonce or Taylor Swift and bazillion dollars to say they think social media is for dorks. Please take emergency exit #4, then proceed along runway #2 for 200m, turn right and cross runway #6 and enter Terminial #1 through emergency exit #12, starbucks is now to your left. It’s this place where a lot of loud kids and teens hang out and never buy stuff. I still find basic stuff missing from the maps app and issues like 'you'll have to park and walk to your destination' when theres a road! I mean great if apple keep it current etc but I suspect it'll only be out of date as soon as it goes live with the speed at while shops change around and airports expand and restructure. I hate to admit google is doing it better but they are is so many areas and apple seems so reluctant to invest the right amount of people and research to really get ahead. I wonder of this will be integrated with Find My Friend so your spouse can find you when you've been taken into detention by airport security for refusing the invasive body cavity search.